If you've been pondering doing some history adventuring of your own, I would very much like to encourage you. No, you don't need me, you don't need a map, you really don't need anything except an idea. My imagination is usually sparked by a photo, like the one up there, which I just chose from random from my collection. 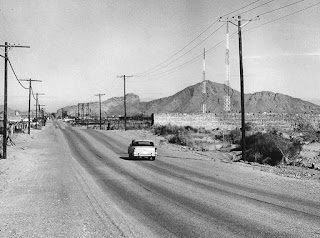 The only thing that I really recognize in that photo is Camelback Mountain, and I know that people who have lived anywhere near that mountain have recognized it, for hundreds, if not thousands, of years. I've been doing this type of adventuring since I was a little kid, and it's only in the last couple of decades that I've started calling it "history adventuring". But really it's mostly adventuring, and the history part of it is actually very light. I don't know why grownups feel the need to have a reason why they do things, I know that I feel more comfortable that way. It's as if someone were going to walk up to me at any minute and ask why I'm doing what I'm doing. When I was six years old I suppose "just looking at stuff" was an acceptable answer, but really not much long after that. I'm looking at Camelback Mountain. I was talking to one of my fellow history adventurers a couple of days ago, and he really explained it well. He spoke of looking somewhere and "stripping away" everything modern, and seeing the mountains, the sky, maybe imagining what might have been there in 1890. And while he's no longer young, I see that his youthful imagination has not left him, and hopefully never will. I'd like to say that there's no wrong way to do history adventuring, but that's not really true. There's a very wrong way to do it - and it can be potentially dangerous. If you decide to go somewhere, just to stand where you can see a particular view from the 1950s, consider that most of the people around you have no idea what you're doing. Going around in a strange neighborhood taking photos can get you a punch in the nose, or worse. Or you could get the cops called on you. And if you say, well, Brad suggested it, they'll probably just take you over to 24th and Van Buren. So please do history adventure with care. I find it the best medicine in the world for my anxious little brain, and it helps connect me with not only places, but people. There are a lot of people who do understand what you're doing, and I'm one of them. You know that you can always count on me to provide encouragement, but not bail money. Let's be careful out there! 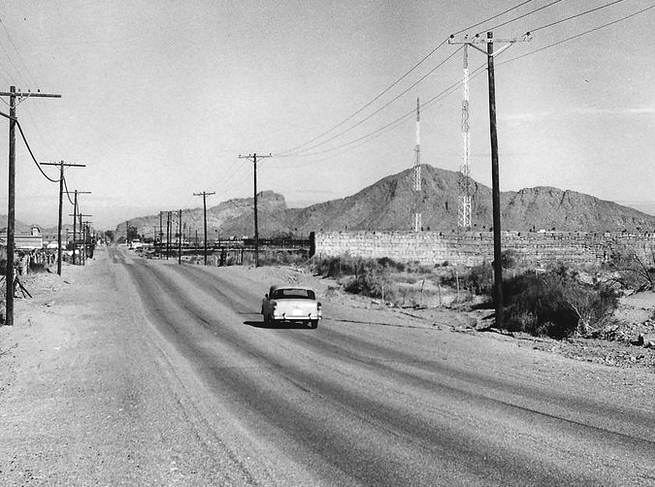 Image at the top of this post: Driving north on 48th Street in the 1950s, Phoenix, Arizona.